I’ve used flax or linseed for years. As a kid we oiled our cricket bats with it. Whole flax seeds are not well digested as they came come out the other end whole, so you don’t get the full benefit of them. If you have dentures or a plate, whole seeds get stuck too, so ground flaxseeds (flax meal) are more comfortable to eat in this case. There are two types of flax seeds. The regular brown flax is mid brown in colour and is the type grown for linseed oil and typically for industrial use. It has a rich and sometimes bitter flavour, even when fresh. Golden flax is a different variety of flax seed and is a light honey coloured seed. The golden flax is milder in flavour and much more palatable but with the same benefits. 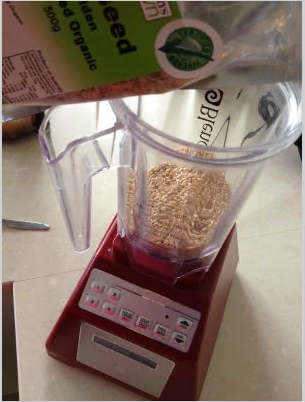 If you grind your own flax meal fresh from seed, you’ll get the maximum amount of nutritional value from the fresh meal. Grinding fresh meal is a snap with my high speed Blendtec blender. You can make it as fine or coarse as you like. Select the whole foods cycle – granita and run for 10 seconds. This will give you a fine grind meal (Middle picture). You can add more seeds per batch to a large 4 side or Wildside jug, but it tastes better to make small batches and have fresh flax meal on hand. In the right picture, do you see the difference between brown flax meal that I purchased from Flannery’s in the right spoon and the golden flax meal I’ve just ground in the Blendtec on the left spoon? The golden meal tasted smoother, nuttier and sweeter too.